Colorful fish of the coral reef variety is made for painting. Bright colors and intricate markings on fish’s flanks cannot fail to create eye catching art. But things can still go wrong, such as going overboard with bright colors that could make the fish appear unconvincing, or mixing two bright colors together to result in muddy colors. Intricate detail on fish can also be a challenge. What is the best way to paint fish that will capture their bizarre colors and formations? Some subject matter is meant for painting, but fish have a tendency to be overlooked in favor of other bright colored objects such as butterflies, flowers or fly agarics. Take a look at any tropical aquarium and you will find a chromatic feast for the eyes. Angelfish, clownfish and triggerfish (above) are three such examples of fascinating reef fish. But painting bright colors such as that found on reef fish is not as easy as one might first imagine. But firstly let’s look at the best art materials for painting bright-colored fish. Fine sables are essential for painting fish markings. I would recommend sable rounds sizes 00 for intricate detail around the eyes, scales and fins; sizes 3 and 6 for bolder lines such as patches of bright colors on the fish flanks. The following oil painting pigments will come in handy for producing any color mix for fish. Titanium white, lemon yellow, cadmium yellow (pale), cadmium red, permanent rose, ultramarine blue, pthalo blue, burnt sienna and burnt umber. The following additional colors could also come in useful: cerulean blue, alizarin crimson, cobalt blue, viridian and Winsor violet. Linseed oil can be added to the paint to make it flow for fine detail. But some colors are oilier than others by nature, so this will not always be necessary. Rags and spirits will keep the brushes clean. A smooth art surface such as a primed board or fine canvas would be ideal for the application of detail. Good visual resources are vital when painting a detailed study of fish. Plenty of suitable images can be found in reference books or one’s own photos. Sketch the detail of the fish lightly with a fine pencil. Begin with the palest colors of the fish to prevent color contamination. If the fish exhibits creams, or pale silvery patches like on the cardinalfish, mix and apply these colors first. Work on the bright colors next, which might be bright red or blue as found on the mandarinfish. Inadvertently picking up a little pale color will not impact upon the bright color. Be careful not to go over any dark areas of the fish such as stripes (if there are any) or this will show up beneath the pale color. Unnecessary layers of paint will need to be applied to obscure it. Apply the darkest colors last. Don’t work the paint too thickly, or uneven lines will result. Keep the paint reasonably thin on the fine sable and wipe off excess paint from the bristles onto a rag. Don’t rush detail. If you go wrong, don’t worry, you can always dab the area off with a rag and work over it once the oil painting is dry. Keep the hand steady by resting the ‘painting’ elbow on a cushioned stable surface. When painting any bright-colored object in oils, it helps to understand a little about the nature of oil pigments. Some are more transparent than others by nature. A first coat of a translucent color such as ultramarine or permanent rose would appear luminescent due to the white art surface showing through. But there is always the danger of patchy paintwork due to uneven thicknesses of the paint that allow some of the white art surface to show through. The artist might be tempted to apply another coat of the same pigment in an effort to create an even coverage. However, with each layer of paint, the color will lose its luminosity, in some cases, resulting in a dull color. This will not be good for painting bright colored fish. In the case of the bright reds found in clownfish (top of page) and the red striations of mandarinfish, it is best to apply a paler red before overlaying it with the final red color. This initial red pigment must not be translucent. Cadmium red is pretty opaque. Don’t worry if this red color does not accurately portray the red on the fish. Apply this bright color with a fine sable to kill the white art surface. Once this initial paint layer is dry, overlay it with a fine glaze of permanent rose in order to deepen the red yet retain its brilliance. This can be achieved with the addition of a little linseed oil to this color. The same can be applied when wishing to render a deep blue found on angelfish or surgeonfish. Apply an initial layer of cerulean blue, which is opaque in nature. Once it is dry, overly it with a thin glaze of ultramarine to deepen the blue. This will retain the brilliance and depth of the blue. You could mix in a little Winsor violet to the ultramarine to add warmth to this color. The following color mixtures will help achieve the desired hues when painting an array of fish. Cerulean blue, burnt sienna and white for silver scales on fish. A little ultramarine and burnt umber will deepen this silver to slate. Cadmium red and permanent rose for deep crimsons. Burnt sienna and cadmium red will produce deep, rusty reds. A little burnt umber will deepen cool down this color. Lemon yellow with a little white and cadmium yellow will produce bright, golden yellows as found on the emperor angelfish (above left). Pthalo blue and a little white for bright, luminescent silvery-blues. A little burnt umber can be added to tone down the blue. Burnt umber, ultramarine and permanent rose will produce deep blacks for stripes found on the flanks of damselfish or cardinalfish. Pthalo blue and a little viridian and white will produce bright green-blue. 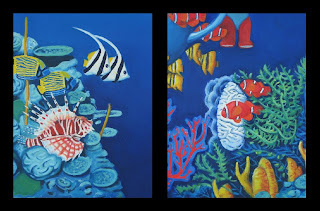 Some fish are more difficult to paint than others, particularly those that exhibit contrasting colors within detailed areas, such as the lionfish, bluestripe snapper or the emperor angelfish (above left). All these fish pose the risk of dirty color mixes as one color could dirty the other. To counter this, apply one color (the paler one preferably), which might be yellow or orange. Once this is dry, work on the other color, which might be blue or purple. This will keep the colors clean. The list below represent suggested color mixes to for the following fish. Yellow tang fish: lemon yellow and a little white. Add a little ultramarine and burnt sienna to darken this color on the underflanks and fins. Damselfish: Mix a little cerulean or cobalt into white for the pale colors. For the dark stripes, mix a little burnt umber into ultramarine. Clownfish: A little cobalt or ultramarine with white for the pale areas. Clown fish exhibit an array of reds, from orange to purple. Useful pigments will be cadmium red and yellow for bright red; add a little permanent rose for deeper crimsons. Add a little burnt sienna for a rusty red. Bluestripe snapper: use lemon yellow and a little cadmium yellow for the yellow markings. A little viridian and ultramarine can be used to darken this color. The bright blues can be achieved by mixing pthalo blue and a little white. Add a little burnt umber to darken this color for shadows. Observe the color of the fish sensitively, as there will always be exceptions. Darken a bright color with its opposing color, or one with a different color temperature. Darken yellow with a little violet or blue; darken red with a little green or blue. Earth colors can be used to tone down any color. Tropical fish provide a great subject matter for painting for their bright colors and intricate patterns. Fish are often overlooked by other bright colored subject matter such as beetles and flowers. Good visual resources are vital for detail. Apply the palest or bright colors first, which might be the silvery stripes of a triggerfish. Watch out for applying layers of translucent pigments, as the result will be an unwanted dull color, which could easily happen with the red areas of clownfish. Apply an opaque layer of a similar color first. Apply the darkest colors last. And finally, allow plenty of time to complete detail. Use good quality art materials. Fine sables will ensure clean lines for detail such as scales or markings on a lionfish.